This is the story of a British academic couple – now a family – and our experiences of working in Scandinavia. It has a happy ending. It is based entirely on personal experience and does not attempt to be a representative overview of the countries concerned. At times, it may seem too good to be true, and I must stress that, even though the tale is quite long, it covers a period of some six years (2007-2013), not all of which were rosy. We are both EU citizens so never had to worry about visas or work permits. In addition, we worked hard, and we have had our fair share of luck – perhaps more than. However, we are both delighted to be working here, and very much hope to continue living in this part of the world. I invite you to read on to find out why. We are an academic family. It wasn’t meant to be that way. We met as teenage undergraduates in Scotland, and academia did not, then, feature strongly on our to-do list for the future. But by the time we were married I had caught the bug, and after a few years working in science outreach my husband Gregor had caught it too. I begged him not to – ‘can’t you see what I’m going through?’, I pleaded – but to no avail. My PhD was awarded by the University of Glasgow, where Gregor did his Master’s. A faculty technicality meant that he was ineligible for PhD funding from the UK, but we were living in Paris and weren’t desperate to go back so, rather than fight it, he began to cast his eye elsewhere. In Scandinavia, he discovered, there is a system whereby each PhD student is actually a ‘stipendiat’, that is to say that they are university employees, full-time ones at that, with all the benefits that that entails. Shall I say that again, in case you didn’t believe me the first time? While studying for a PhD, a student is a fully fledged employee of the university. Sure, the contract has a duration – you are, after all, expected to finish within a certain time frame – but still, a three- or four-year employment contract with a PhD awarded at the end of it (provided you do the work of course) was certainly appealing. The three Scandinavian countries – Denmark, Norway and Sweden – are obviously all different in their laws and regulations, but they have a lot in common. They run a system of high tax and high benefits. The cost of living is significantly higher than other countries (perhaps with the exception of their Nordic neighbours, Finland and Iceland), but salaries are also higher. Sales taxes are high (typically 25%), and bordering on the extortionate for ‘luxury’ goods such as alcohol and tobacco (and, in Norway, motor vehicles). Income tax runs at around 30%. On the other hand, the health systems are virtually free (adults are liable to nominal charges for doctor’s visits, prescriptions and hospital stays) and well-maintained. Education is free, with maintenance grants and loans available from the government for post-16 study. Preschool, for children aged 1-6, is so heavily state-subsidised that virtually every family chooses to send their kids, and stay-at-home parents are relatively rare. Child benefits are reasonably generous, and paid until the ‘children’ reach the end of their secondary education. Parental benefits are among the most generous in the world: Sweden, for example, offers 16 months of parental leave to be divided between the parents before the child is 8 years old, at 80% of salary (which employers often voluntarily top up to 100%), with additional tax benefits should the father take at least half. Indeed, parental leave is something both parents are encouraged to take: it is recognised that looking after young children is much harder than being at work, teaches skills such as time-management, prioritisation, crisis-handling and working under pressure; not only this, but parental-leave cover offers many young people their first step on the career ladder. In short, the family-focused society and generous parental-leave allowances are seen as advantages by employers and employees alike. And so the hunt for a PhD in Scandinavia began. It is worth spending some time describing the process, since a similar process is followed at all levels of academia, and it was not at all as we had assumed. At that time, neither of us spoke a Scandinavian language (the three languages are mutually comprehensible), however, for the PhD level, this was not a great disadvantage. National and university job websites were thoroughly scanned (there is a list of some of these at the end of the tale), applications were made, work samples were sent (in multiple copies and by registered post), and the waiting began. It was a great surprise to receive the first acknowledgment some weeks later. It was clearly a standard letter, but its contents caused considerable eyebrow-raising in our small Parisian flat. Not at the appointment of a specialist, independent committee (from multiple institutions) to objectively assess all of the applications, but at the list of names, addresses and dates of birth of all the applicants. All of them. As more of these letters arrived, we realised that this was the norm. And then the committee reports began to appear. These included a detailed description of each candidate’s research and education to date, their proposed research, an evaluation of their work samples, and the committee’s judgment on whether or not they were fit for the stipendiat post. Finally, the committee ranked the candidates in order, signalling which they recommended for interview. As the months passed by, these reports gave a great insight for us outsiders – and presumably to all the candidates – as to what committees were looking for. A careful scanning of the merits of the top-ranked candidates (with the help of google translate if the assessment was not presented in English) meant that Gregor was able to become his own careers advisor. Soon he was moving up the ranks, from the middle to towards the top. Finally, a telephone interview, and, the day after a test had shown we were expecting a baby that summer, a job offer. To his surprise, when he accepted the job and mentioned the baby, his new boss was delighted for us (this was our first introduction to the family-focused society I described earlier). The time from sending out the first applications to receiving the offer was about one year – somewhat faster than for postdoctoral jobs, as part two of the tale will show. 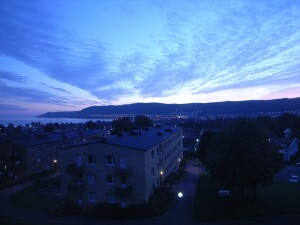 The start date was as soon as possible, so Gregor immediately set off for Jönköping University in Sweden. And so the PhD began, soon I too moved to Sweden, our daughter arrived, and parental leave was taken. (Remember, PhD students are employees, so they are entitled to parental leave. 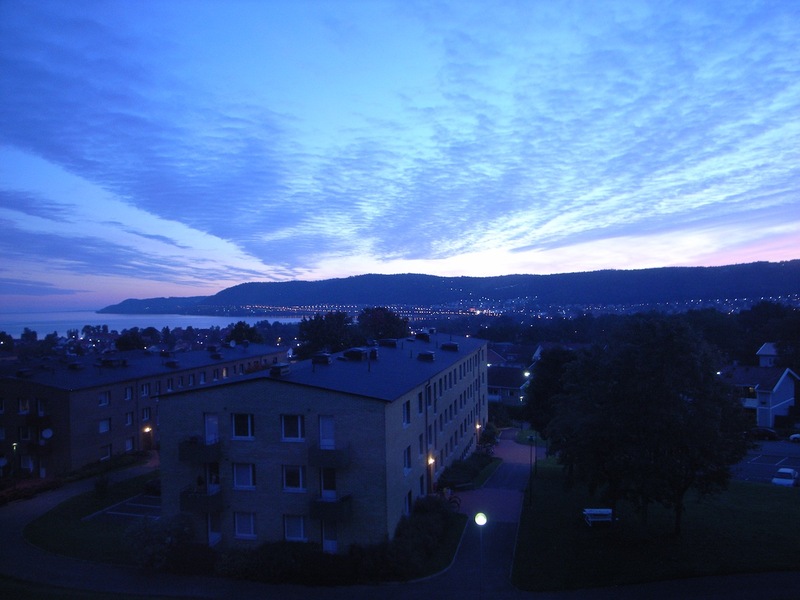 In fact, Jönköping University is one of those employers who ‘top up’ the state leave payments, so Gregor’s leave was taken on full salary.) In the meantime, managing our hours to take care of our daughter, I followed the state’s Swedish courses (education is free in Sweden, as I said), becoming quite proficient in the language and qualified in it to university level. I was also offered a teaching position back at my Scottish institution – with Gregor taking a full-time ‘sabbatical’ with his parental leave to look after our daughter – giving me valuable postdoctoral teaching experience. Thanks to the preschool system, once our daughter was one year old she was entitled to a full-time place in the local preschool, allowing us both to work full time, with me doing an international commute. (Remember I said childcare is affordable? The cost was income-based, up to a maximum of c. $250 per month. No, I haven’t forgotten a zero or two. And we didn’t have to pay anywhere near the maximum.) When I became pregnant again I decided to start a business working from home, doing something I’d been doing occasionally for Gregor’s colleagues – helping Swedish academics perfect their research publications in English. On quiet weeks I continued with my own research, for I had hopes of a postdoctoral position when the family was ready for it. My PhD is, as is typical of an arts and humanities PhD awarded by a British university, a monograph. Gregor’s, however, in the field of health and psychology, is a collection of published, peer-reviewed articles, presented in their journal proof forms, and combined in one volume with a ‘mantle article’ linking these five publications and outlining the methodology for the whole project. This means that, on entering the job market, he had five publications in peer-reviewed journals under his belt, a few more under review or on the go, and he had a whole host of ‘doctoral credits’ from passing the various research-training courses offered by his university. (The University of Glasgow, where I did my PhD, also offered a research training programme which was certainly useful, but it was not such an integral part of the degree as was that at Jönköping University.) In four and a half years he had achieved the PhD degree with multiple peer-reviewed publications, had taken leave with two children, and had been paid for it all. I stress this deliberately, for his salary was enough to support us all. Any money I brought in paid for luxuries, such as travel or the occasional bottle of wine, but the four of us could – and at times did – survive on one PhD salary. Gregor had taken part in successful funding bids to extend his project beyond its original time frame (because of the parental leave). We therefore had plenty of uncertainty about the future as the years went by, but never was he expected to work for nothing, and his teaching commitments were enough to give him experience, but never enough to interfere with his research. Part 2: Post-PhD Jobs in Norway, to follow. In addition, we regularly scoured individual institutions’ websites for their vacancies pages. Vacancies were not always presented in English, so look for the words ‘lediga jobb’, ‘lediga anställningar’ or ‘platsannonser’ (Swedish), or ‘ledige stillinger’ (Norwegian/Danish). Lists of universities and university colleges (högskolor/høgskoler) are easy enough to find on the internet with a simple google search. Thank you for your article! I’m very interested in reading Part II. Many Ph.D. programs in Germany, the Netherlands, and Belgium are also paid employment agreements. I too have lived in northern Europe and have benefitted from the wonderful socio-financial investments in education. I think that it’s fair to point out, however, that at the Ph.D. level, coursework and supervision is absolutely minimal – which is the norm throughout Europe. One must be aware that Ph.D. programs are research opportunities, or at the very least, opportunities to teach oneself. They are not so much intended for training as they are independent research. That said, I wonder how you have assessed the quality of education. My experiences in Scandinavia have been that independent, critical thinking is a often discouraged if it deviates from ‘the pack.’ There is so much emphasis on social conformity that the diversity of opinions, which is key to academic and theoretical innovation, can really suffer. Moreover, there is much more emphasis on applied work, rather than that which is theoretically informed. What has your experience been like, in this regard? Lastly, I would like to hear about your experiences, if any, with Scandinavian ethnonationalism. Are you both of “white” European ancestry? I have heard that in the long run, ethnonationalist protectionism gets rather tiring in Norden. Thanks again for your thoughtful piece. It’s very encouraging. Thank you for your response. As the contributing partner to the original article I’ll respond to your points – and I think Kate might do too (if I know her!). Certainly if you are coming from a North American perspective (and I’m guessing you are or a writing with one as this whole website is) European PhD programmes can seem very course-light and are more focussed on training you as a researcher. As an example my doctoral programme comprised of 240 points (spread over 4 years) of which 90 had to be accumulated from courses. In response to your critical thinking critique, I would agree that Scandinavians are at the more dour end of the outward-going spectrum; however the social conformity that you speak of could rather be attributed to the Nordic Jante way of thinking which sees fair distribution and opportunities taking precedence over personal, individual betterment (I suggest readers google Jante Law for some background). In essence this means that Nordics are not particularly welcoming of overly forthright and confident persons – especially if they think that the person has unjustly taken a larger share of resources (such as speaking over someone or for too long). This can be seen in meetings often when every person is allowed an opportunity to voice their thoughts and opinion. One way to cause cultural frictions is to try and be explicitly competitive and to push yourself forward – this will not make you welcome! You can still promote yourself, you just have to do it humbly and relatively discretely. As broad cultural comparisons, I have seen similar parallels in Scottish, Canadian, and New Zealand cultures which I believe can all trace strong connections back to Calvinism. One big positive outcome of Janteism is that it has created very strong social cohesion and thus the world-famous Scandinavian social welfare systems. Personally, I don’t mind this more conservative way of operating (though my Scottish background probably makes me more receptive to it) as it removes the stressful and overtly competitive academic shenanigans which can go on elsewhere. I think it is difficult to say whether Scandinavia is more or less practical/theoretical, it will vary so much between disciplines. With my own field of disability research Scandinavia has produced some world-class practical and theoretical work. Perhaps Kate can give more insight coming from the more theory-based humanities? In response to your point on ethnicism, I would agree that Scandinavia is a little prone to ethnonationalist protectionism and is still adapting to having immigrants. In essence Scandinavia was poor for much of the 20th century and thus tended to export people until quite recently and it wasn’t until the economic returns of the social-welfare systems kicked in (which took most of the 20th century) that immigrants started to appear in serious numbers. Therefore, most immigrants are still of first or second generation descent and some older people still occasionally consider them to be guest workers. There are significant immigrant populations from Assyria, Somalia, the Balkans, and Kosovo along with a smattering from other nations and implicit ethnic discrimination exists (as in many places) where immigrants tend to live in the poorer areas, take the lower-paying jobs, etc. The job market can be challenging for educate persons who do not look like traditional Scandinavians; this does concern Scandinavian people as a whole and there is awareness and attempts to combat the phenomenon with very inclusive legislation and anti-discrimination laws, but I think it just needs time to develop. In some ways I think Scandinavia is quite like the UK was 30 or 40 years ago – e.g. Malmö (Sweden’s third city) recently had race riots similar to those that hit London in the 1980s. We are of “White European ancestry” so have perhaps missed some of the appearance-based ethnic stuff. I wonder if some of the perceived hostility comes from the conformism that immigrants don’t have and the original expectation from the indigenous population that all immigrants immediately would want to be the same as them. I have studied Economics (Bachelor and Masters) from a South Asian country, and then another Masters in Economics from University of Sydney. I have more than 10 years of experience in the field that I work in: health economics. No, my PhD interest is unfortunately not in Economics. I feel passionate in working on poverty/ inequality and livelihood improvement issues. I am not sure where to begin my search (of department, university) and how to begin (i.e. contact professors, apply? ), etc. Was wondering if you could perhaps help me? Would it be too much to request if you could perhaps email me instead of posting the response here in your site? Ok, hope to stay in touch with you and be inspired!